WP Engine is a popular WordPress host. DeployBot supports deploying your WordPress site that is in a Git repository to WP Engine through SFTP deployments. Below are the steps to connect WP Engine with DeployBot. First, you’ll need to create an SFTP login in WP Engine. To create your login navigate to the install page in the WP Engine user portal (https://my.wpengine.com/installs). 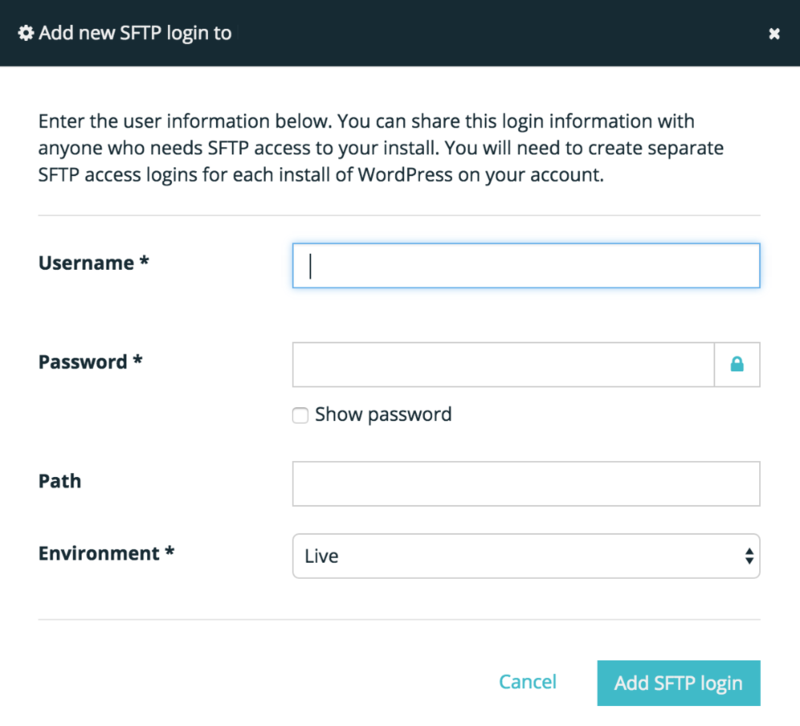 From the install page, choose the WordPress install that you’d like to create your SFTP login. After selecting the install scroll to the bottom of the page and click “Add Login”. Username - This is the SFTP username. The username will follow the convention of wp_engine_account_name-username. Password - The password for your SFTP user. Path - This is the directory in WordPress where your SFTP user will deploy to. By default, you’ll want to keep this blank, when left blank the path will be the root directory in your WordPress install. The path is if you are using DeployBot to deploy a particular directory on your WordPress site (i.e., wp-content/plugins/plugin-name). Environment - With each WP Engine WordPress install you are given a Production (install-name.wpengine.com) and staging (install-name.staging.wpengine.com) site. 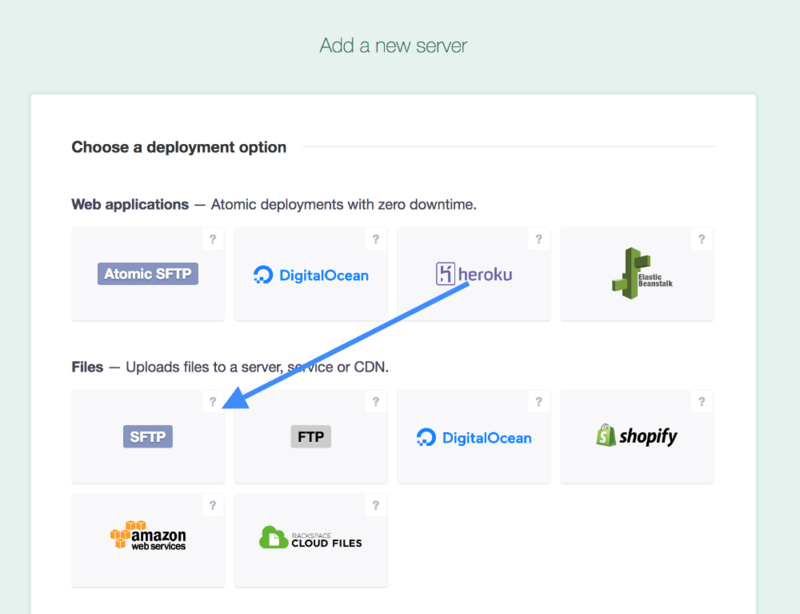 Choosing the environment allows you to pick what site your SFTP user has access to. After filling in the above information, click on “Add SFTP login”. This login is now ready to be connected in DeployBot. After creating your SFTP login, you’ll need to add WP Engine as a server to deploy to in DeployBot. To do so, go to the Server & Settings section in DeployBot for the environment that you’ll be connecting and click on “Add Server”. On the “Add new server” page click on SFTP. On the “Add a new SFTP server” page you’ll be able to enter your WP Engine Server details. Host - The address of your WP Engine site. It can be either the Server IP address for your install or you can use DNS where it’ll look like install-name.wpengine.com. Port - WP Engine SFTP uses port 2222. Destination path - This is similar to the path option in WP Engine. DeployBot will deploy to the root directory the user has access to in WP Engine. If you’d like to, DeployBot can handle deploying to a specific directory on your site that can be set here. Otherwise, it’s best to leave this blank. Username - The SFTP login username created in WP Engine. Password - The SFTP login password created in WP Engine. After entering the SFTP login information, you can make any DeployBot setting changes that are necessary like excluding file paths from your repository for deployment or choosing the current commit in the repository to deploy from. Save the changes at the bottom of the page and DeployBot will add your WP Engine SFTP connection. After DeployBot connects to WP Engine, the Servers & Settings page for your environment will list your SFTP connection with a “Connection Established” message. After setting up your SFTP login information in DeployBot, you’re ready to deploy your WordPress site to WP Engine! Do you have questions on deploying to WP Engine? Don't hesitate to contact our support. We are always glad to help.